Verden går framover. Stadig nye hjelpemidler dukker opp. Det finnes flere muligheter til å skaffe launch monitorer. Her er en. Nyvinninger i treningsarbeidet er nyttige. Slike hjelpemidler gjør at man kan perfeksjonere svingen. "Foresight's technology images the exact movement of the dimple patterns on the golf ball, to ensure pure, accurate, reliable data, making it the only technology suitable for all seasons and conditions - whether indoors or on the range - and is the only launch monitor able to provide trusted data for every club, every shot, every player and every swing, all to the highest accuracy levels in the industry." PGA de Españia anbefaler denne monitoren. PGA de España's president, David Pastor, forklarer: "The Foresight Sports GC2 contains features ideal for our game analysis. When we were introduced to the GC2, through Golf Strategy, we were able to verify its accuracy, reliability and ease of use. Now we are using the GC2, we are confident it will be of great benefit to all of our members to have the latest, market-leading launch monitor technology available for their use." 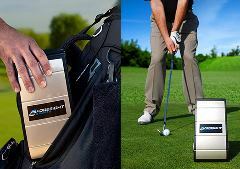 Golf Strategy proprietor José Mª Górriz sier dette: "The GC2 is very easy to use. The on-screen data - ball speed of the ball, launch angle, side spin, back spin, total spin, axis and carry - can be read immediately, on a smartphone, tablet or PC. It is the cornerstone of a practice regimen, an essential piece of a coach's armoury - either inside or outside on the range - and can be upgraded to provide an unprecedented level of realistic golf simulation. It is the most essential piece of kit in the golf industry currently, for Tour professionals, teaching professionals, golf club and indoor golf centres - all of whom are finding it indispensable and light years ahead of other technology on the market." Vi skal ikke glemme at det finnes en del konkurrenter på markedet.